Here are the most important FAQs answered by a licensed professional public adjuster to help you, our client decide what’s best for you and whether you should hire a public adjuster and when to hire a public adjuster and find out what a public adjuster do for you and your claim process. The burden of proof to prove the extent of your loss to the Insurance Company lies squarely upon your shoulder! Insurance policies are very rather long. They contain a lot of confusing legal language. There are also many conditions, restrictions and limitations. Policy language gets very technical. This adds to the stress of an already distressful loss experience. For an insurance company to write that check which will allow you to rebuild after your loss, there are certain conditions which must be satisfied. Failure to do so could reduce your settlement amount or worse still cause your claim to be denied. Public (Insurance) Adjuster Definition:- A Public (Insurance) Adjuster may be an individual and or business entity who receives, either directly or indirectly, a salary, fee, commission or other compensation for investigating, negotiating, adjusting or providing advice to an insured policy holder in relation to first party claims arising under insurance contracts that insure real or personal property of an insured for the purpose of effecting the settlement of a claim on behalf of the insured. Want more information? Wikipedia : Public Adjuster or Request YOUR FREE Insurance Claim Review! The Public Adjusters EXCLUSIVE responsibility is to protect YOU and YOUR insured interests in an Insurance claim(s) against a loss with the Insurance Company. Think of an adjuster as your advocate/campaigner/spokesman going to bat for you. 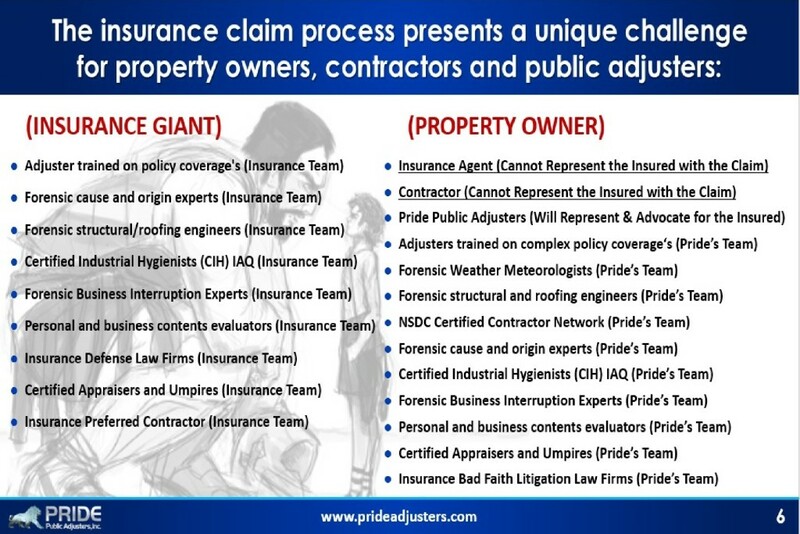 Why Choose Pride:- At Pride Public Adjusters we DO NOT work for ANY insurance company. We are not public employees, and do not work on behalf of the State. We are hired to work for YOU – the public. What Is A Public Insurance Adjusters Job Description? property/buildings, its contents and any other additional expenses that support the claim on behalf of the insured. Determine the cost of business interruption losses. Re-open a claim and negotiate for more money should a discrepancy be discovered EVEN AFTER the claim has been settled. When Should You Hire A Public Insurance Adjuster? If you have just SUFFERED what is considered “an insurance loss” a public adjuster is highly recommended! If you want the MAXIMUM entitlement that your policy qualifies you … you got it Hire a public adjuster! As policy holder you should use a public adjuster as it PROTECTS you from the stress of engaging in an adversarial role with a large insurance corporation. Pride Public Adjuster Advice – Get an adjuster, BEFORE the fact-finding stage. This will give us more time and better leverage to assist you the policyholder in getting a fair settlement for all losses legitimately covered under the insurance policy! Are Public Insurance Adjusters A Good Or Bad Idea? Your insurance company employs adjusters (staff or company adjusters) whose ONLY objective is to protect their employer by reducing the amount of the claim as much as possible. Public Insurance Adjusters/Public Adjuster Pros and Cons: Expert, Trustworthy & Highly Knowledgeable help! How Does A Public Insurance Adjuster Get Paid? The question “how do public insurance adjusters get paid?” is often at the forefront of any insurance policy holders mind. Pride Public Adjusters Inc. does not assess any fees until we have settled your claim. This practice ensures that we are working exclusively for you (the insured), for the best possible outcome of your claim settlement amount. Pride Public Adjusters Inc. retains a fixed percentage (determined on case to case basis) of the total settlement amount. Information for Consumers in the U.S.
– Lost your insurance policy due to damage or loss? No Problem! BY THE INSURER THAT MAY APPLY TO THE CLAIM PRESENTED BY THE CLAIMANT(This is one of the big reasons we advocated that YOU the insured Should Hire A Public Adjuster). -You can contend the insurance company estimate and they must adjust the claim within reason. 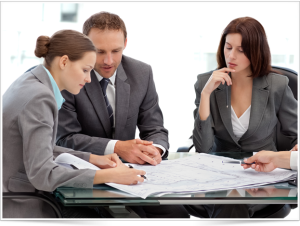 company is required to contact you to appraise you of the process of your claim every 30 days. ADDITIONAL PROOFS OF Claims the insurer shall IMMEDIATELY COMMUNICATE this fact to the insured and COOPERATE with and assist the insured in determining the extent of the insurer ‘s additional liability. I. Is the Public Adjuster licensed in the state of the loss and is there a public insurance adjuster code of ethics. Public insurance adjusters MUST be tested, licensed and bonded in most states. II. Does the Public Adjuster have consumer reviews (Yelp!, Google+, Facebook etc), client testimonials & references? Are they willing to provide you this information upon request? III. What are the Public Adjusters personal credentials? e.g., certifications, diploma, past business experience pertaining to the insurance industry, construction industry, architecture etc? IV. Have they explained to your satisfaction how they are to be paid? V. Have they detailed how recovery funds are remitted? VI. Are diligently interested in your case? VII. Does the public insurance adjuster contract spell out in detail what is to be expected?